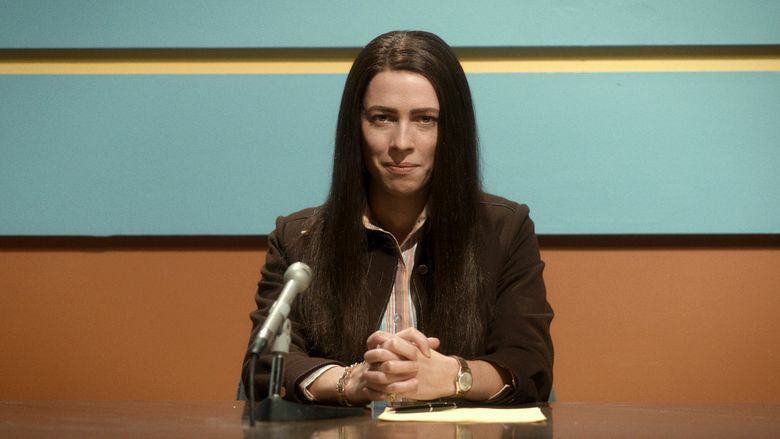 Rebecca Hall is “Christine,” a struggling 29-year-old reporter at a Sarasota, Fla., television station. The story is based on true events. In “Christine,” Rebecca Hall plays a woman carrying the terrible weight of depression. You can see it in her pulled-down posture, in her perpetually worried expression, in the mane of hair she uses as a blanket, in her way of wandering alone through a party as if it’s a war zone, clutching at the door like a lifeline. It’s 1974, and Christine Chubbuck is a 29-year-old reporter at a Sarasota, Fla., local news station. She’s nakedly eager for advancement — there’s something wistful about the way she makes earnest to-do lists and carefully analyzes footage of herself — but she’s not good at playing the game. “If it bleeds, it leads,” says her boss (Tracy Letts), enjoying the phrase as he dismisses Christine’s pleas for a more nuanced approach to the news. Directed by Antonio Campos, “Christine” is based on true events, and I suspect it’s all the more powerful if you don’t know what happens at the end. I did, but the film still gripped me. The small-time-newsroom setting is irresistibly compelling — this movie’s sort of a dark cousin to “The Mary Tyler Moore Show,” whose theme song makes a spot-on appearance. The cast economically creates a believable workplace: the handsome, not-too-bright anchorman (Michael C. Hall), the sweet young camerawoman (Maria Dizzia), the slightly defensive weatherman (Timothy Simons). Caught in flat light, the sets have a tired 1970s hipness, and the cinematography has the fuzziness of old photos blurred soft. ‘Christine,’ with Rebecca Hall, Michael C. Hall, Tracy Letts, Maria Dizzia, Timothy Simons, J. Smith-Cameron, Kim Shaw. Directed by Antonio Campos, from a screenplay by Craig Shilowich. 118 minutes. Rated R for a scene of disturbing violence and for language including some sexual references. Sundance (21+), SIFF Cinema Uptown. But it’s Hall’s performance that jolts “Christine,” carrying the movie on her slumped shoulders. A virgin at nearly 30 (she laughs bitterly when a doctor diagnosing her stomach pains suggests a pregnancy test), she lives with her mother and is achingly lonely. You see, in a scene in which she “interviews” an affectionate couple in a restaurant, her need to reach out, and her utter inability to do so.